SmartSurvey lets you control the size, positioning and display options for each individual question. If you wish, you can also specify a CSS class for additional control. Click Add Question to add a new question, or click Edit Question to customise an existing question. Click the Question Size and Positioning checkbox at the bottom of the popup. Set the width, spacing and CSS class as required. Width Allows you to change the width of the question. Can be adjusted using percentages or pixels. 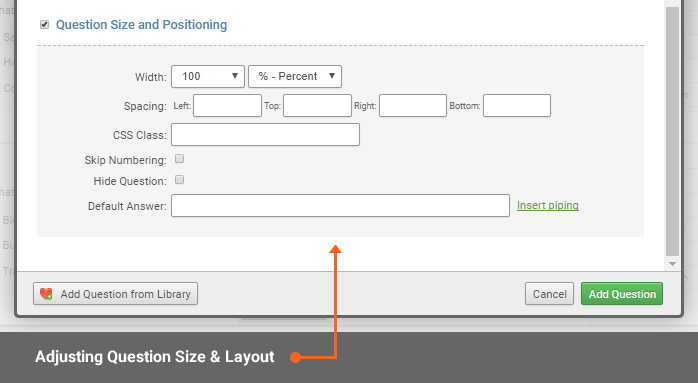 Spacing Spacing gives you the ability to add padding to your question for a specific side of your question. The values that are required are in pixels so ensure you enter a number following px to make it work. CSS Class You can append a class to your question. This can give you additional control when styling your survey or if you need to use scripting. Skip Numbering This will set to exclude the question from the numbering system in your survey. Hide Question Hide question will make your question invisible from the survey. Default Answer Pre-set default answers to questions. You can even pipe from custom variables or contact list data.